If you wish to become a Sea-to-Sea route supporter, please send donations to Scenic Trails Research. Trails: Connects 5 Major long-distance trails. Article from December, 2011, about the Sea-to-Sea Route. In 1968 Congress created the National Trails System. Of its three categories of national trails, the "national scenic trail" category currently includes 11 long pathways. Unfortunately the National Trails System still lacks the cohesion of a genuine "system." So in 1996 Ron Strickland proposed the creation of an east-west route to link four of the longest national scenic trail. This Sea-to-Sea Route (C2C) would use the PNT, CDT, NCT, AT, and IAT to create a transcontinental passage from the Pacific Ocean to the Atlantic Ocean. As of now, C2C is a concept route, not a club or a government agency. There are no employees and few volunteers. Instead C2C challenges us to create and explore a true, unified National Trails System. Europeans already have such a skein of routes to unify their continent. [http://www.era-ewv-ferp.com/frontpage/] Isn’t it time that we in North America put it all together for this and future generations of backpackers? This proposed transcontinental trail in no way diminishes the luster of its components. The whole is greater than the sum of the parts. Each leg remains as a fabulous, independent entity. Our goal at Scenic Trails Research is to create new opportunities for all walkers through C2C's enhancement of the National Trails System grid. The Sea-to-Sea (C2C) Route would begin at Cape Alava on the wilderness coast of the Olympic Peninsula. It would follow the Pacific Northwest National Scenic Trail (PNT) east 1200 miles to Glacier National Park. A Sea-to-Sea Route backpacker would continue south on the Continental Divide Trail (CDT) to and beyond the Bob Marshall Wilderness to the Benchmark campground. A gap of approximately 900 miles exists east from the Continental Divide National Scenic Trail to Lake Sakakawea and the North Country National Scenic Trail in North Dakota. The Sea-To-Sea-Route will follow the North Country National Scenic Trail (NCT) east 4600-miles to Lake Champlain on the New York/Vermont border at Crown Point. The Sea-to-Sea Route will follow the Appalachian National Scenic Trail (AT) northeast to Mt. Katahdin in Maine. The easternmost C2C segment will follow the International Appalachian Trail (IAT) northeast to Cape Gaspe on the Atlantic Ocean. 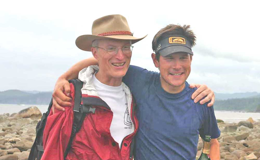 Ron and Andrew Skurka celebrate Andrew’s completion of the route (2005). Read about the background of Andrew's extraordinary C2C adventure in "Pass It On" (pages 113 to 124 of Pathfinder ). 1996: Ron Strickland proposed creation of a 7700-mile transcontinental Sea-To-Sea Route (C2C) to link existing long distance trails from the Atlantic Ocean to the Pacific Ocean. Ron's primary goal was to improve the National Trails System by creating an east-west backbone for the 8 existing national scenic trails. He felt that C2C would (1) unify what we already have and (2) encourage the development of more long distance trails. In that way it would ultimately introduce a new generation of hikers to love of the environment and passion for outdoors adventure. 2003: Backpacker Magazine was the first national publication to publish a description of Ron's proposed Sea-To-Sea Route. 2004-2005: To demonstrate the desirability and feasibility of this transcontinental pathway Andrew Skurka completed its first thru-hike on July 10, 2005 at Cape Alava. Andrew's 11-month transcontinental trek is chronicled at http://www.andrewskurka.com/. Cape Alava, July 10, 2005: Ron Strickland and Andrew Skurka celebrate Andrew's completion of the Sea-To-Sea Route. For an excellent article about Andrew Skurka's C2C trek, please visit Outdoors Northwest Magazine. Click here for a Podcast interview with Andrew Skurka. 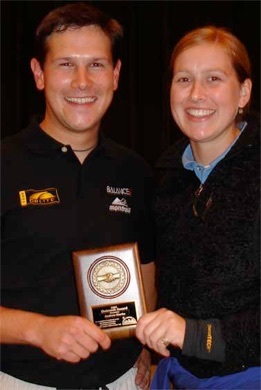 2005-August: Backpacker Magazine named Andrew Skurka its "Person of the Year" in honor of his amazing C2C thru-hike. 2005-October 8: ALDHA-East Gathering: C2C thru-hiker Andrew Skurka receives a distinguished service award (North Country Trail Association) in recognition of his 11-month trek. 2005-December 3: The board of directors of the North Country Trail Association passed a Sea-To-Sea Resolution to explore the feasibility of establishing trails "in the gaps between existing trails and trail projects." 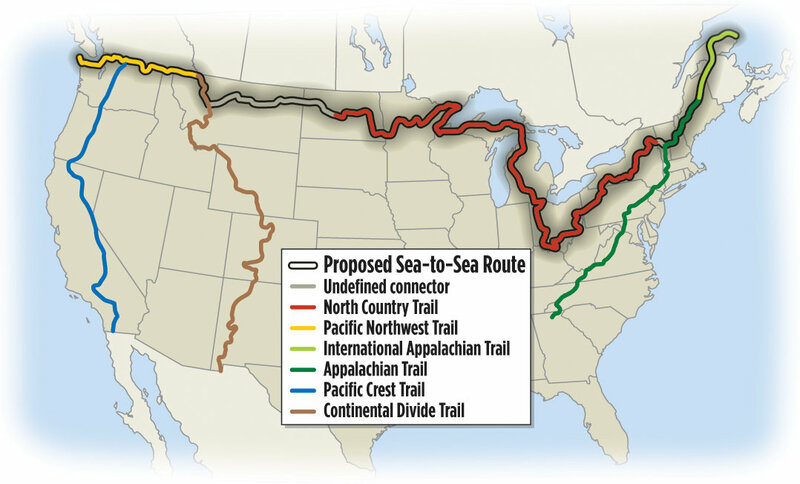 They said that if the creation of the Sea-to-Sea Route proves feasible, they will "give consideration to fostering the creation of extensions of the North Country National Scenic Trail eastward and westward, if such extensions can be established consistent with the standards and uses already established for the trail and such extensions are authorized by Congress." They explained that, "The Pacific Northwest Trail, being developed from the Pacific Ocean in the State of Washington to the Continental Divide in Montana, spans more than half of the distance between the Pacific Ocean and the present western terminus of the North Country National Scenic Trail in North Dakota. The Sea-to-Sea Route proposed by Ron Strickland is rekindling interest in and would fulfill the original intent of a cross-country National Scenic Trail in our Northern tier. Interest in the Sea-to-Sea Route has been further heightened by the 2004-2005 journey of Andrew Skurka along this 7,700-mile route from the Gaspe Peninsula in Quebec, Canada, to Cape Alava in Olympic National Park in Washington State." The 4,600-mile North Country National Scenic Trail makes up the largest portion of the 7,700-mile Sea-to-Sea Route. 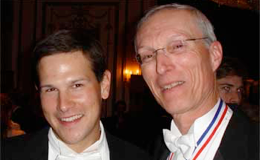 2006-March 18: C2C thru-hiker Andrew Skurka addressed the Annual Dinner of the Explorers Club in Manhattan. 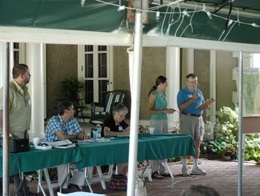 2007-June 9: Tom Gilbert (National Park Service, Madison, WI) and Claire Cain (North Country Trail Association) addressed the Annual Meeting of the Green Mountain Club at Hildene, Manchester Village, VT about the possible expansion of the North Country Trail. This expansion would be part of the overall C2C route. 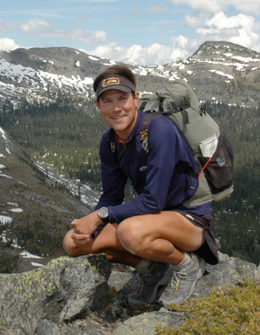 November, 2007: National Geographic Adventure Magazine named Andy Skurka “Adventurer Of The Year” after he became the first person to thru-hike the 6200-mile Great Western Loop. Having just rehiked much of the Pacific Northwest Trail as part of the GWL, Andy said, “I highly recommend the Pacific Northwest Trail to hikers for its superb combination of scenery and adventure. Congress should add the PNT to the National Trails System as soon as possible." December 4, 2007: Tom Gilbert (superintendent, NPS, North Country National Scenic Trail) and Clare Cain and Bruce Matthews (North Country Trail Association) met with stakeholders in Addison County, VT to discuss the potential for extending the NCT eastward from its current terminus at Champlain Bridge (see photo) to the Green Mountains. January, 2008: The Sea-To-Sea Route is America's newly-developing, transcontinental hiking trail. Because the greatest challenges to completion of C2C have been the gaps in Vermont, North Dakota, Montana, Idaho, and Washington, progress continued in 2007 toward filling those gaps. First, the North Country Trail Association continued to work to expand its 4600-mile "national scenic trail" east into Vermont and west to the Continental Divide. Second, the Pacific Northwest Trail Association continued to develop its 1200-mile route from Glacier National Park to Olympic National Park. • Empower and unite grassroots efforts, particularly among stakeholders that serve the nonmotorized public. • Foster interagency coordination for congressionally-mandated parts of the National Trails System. • Fund competitive grants to both “official” and non-official trails. • Publish an Annual Report about the status of the National Trails System and of progress in the broader trails community. • Promote public awareness of recreational opportunities on America’s trails. • Plan and host a biennial National Trails Conference. 1. Reports: e.g., a comprehensive study of the economic impacts that NSTs have on regions, states, and towns. 3. Reference materials: e.g., a comprehensive, GIS trails inventory. 4. The National Trails Library, National Trails Archives, and National Trails Museum. April 7, 2008: At its March meeting, the board of directors of The Green Mountain Club, builder and maintainer of Vermont’s historic Long Trail, voted to notify Ernest Quintana, Midwest Regional Director of the National Park Service, that GMC supports continuing the process of exploring a North Country NST extension into Vermont. A letter to that effect was sent to Mr. Quintana, copied to Tom Gilbert of NPS and Bruce Mathews and Clare Cain of NCTA, on April 7. February 16, 2009: "National Scenic Status Sought For Pacific Northwest Trail" Seattle Times, front page article by Linda Mapes. The Pacific Northwest Trail is already an integral part of the de facto Sea-to-Sea Route. March 23, 2009: "National Scenic Designation Likely For Pacific Northwest Trail" Seattle Times, by Lynda Mapes. March 25, 2009: The House of Representatives passed H.R. 146. Thesignificance of this legislation went well beyond the fact that the the PNT, AZT, and NET were the first national scenic trail designations since 1983. Obviously they were superb additions to the National Trails System. But, considered in the broader, national context, they were also symbolic of a trend toward development of a more comprehensive skein of trails in all regions of the Lower 48. In particular, designation of the Pacific Northwest National Scenic Trail had the additional benefit that its 1200 miles could be subtracted from the total of missing miles in the 7700-mile, transcontinental Sea-to-Sea Route. [Please help to to locate and develop the remaining 900 miles by joining the North Country Trails Association.] The ultimate significance of passage of H.R. 146 was that the dream of a transcontinental pathway across America was 1200 miles closer to reaching fruition. And the vote highlighted the importance of the next great challenge: to complete the remaining 900 miles of the transcontinental Sea-to-Sea Route in time for the fiftieth anniversary of the National Trails System in 2018. September 10, 2009: "Big Plans In Store For Middlebury Trail: MALT Foresees National Collaboration." September 26, 2009: Fourth Annual Trail Festival, Milford, Ohio. Summer, 2010: Expansion of the North Country Trail to Vermont’s Long Trail as part of the Sea-to-Sea Route (pages 8-9). 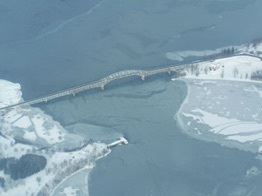 November 7, 2011: “The new Lake Champlain Bridge is now open to traffic!” Crossing Lake Champlain, this new bridge provides crucial C2C pedestrian access between the states of New York and Vermont. January, 2012: Andrew Skurka's slide show of his 11-month, Sea-To-Sea Route thru-hike is now available on CD. May 21, 2012: May 21, 2012: Big News: the Vermont eastern extension of the NCT is finally making discernible progress!! The Middlebury Area Land Trust and the National Park Service held an informational public meeting in Weybridge, VT to present the results of a feasibility study for extending the North Country National Scenic Trail from its present terminus at Crown Point, New York, to the Appalachian National Scenic Trail east of Rutland. The preferred alternative was a 40-mile long corridor through private, state, federal and national forest land. The corridor would make use of existing Middlebury Area Land Trust (MALT) Trail around Middlebury, and hiking trails on the Snake Mountain Wildlife Management Area. For more information seeVT_Feasibility_Study_and_Corridor_Plan_Press_Release-final.pdf. The Addison County Independent newspaper subsequently published "Plan Floated to Link Famous Hiking Trails Through County." September 2013: Thru-hiker Luke Jordan hikes the NCT extension and a bit of the Long Trail across Addison County, VT to the Appalachian Trail at Maine Junction. March, 2014: Subaru Magazine reports on the Sea-to-Sea Route. Final development of the Sea-To-Sea Route will not supplant its constituent parts but enhance them as parts of a transcontinental vision. This route has history, scenery, and adventure. It mostly uses long distance trails that have already received public recognition. The Sea-to-Sea Route is the best way to link the three "Triple Crown" trails into a true national system. The 200th anniversary of Lewis and Clark's epic journey reminded us that exploration is an essential part of the human endeavor. C2C distills that spirit of adventure for 21st century walkers. In the 19th century, ordinary people talked of "lighting out for the territory." Millions sought their dreams over the horizon in the forests and on the prairies. From settled precincts to the wildest mountains, they made their way on foot and on horseback. Now, generations later, that excitement can be rediscovered on the Sea-To-Sea Route. Whether you have a day or many months, C2C's opportunities await you. Experience the simple joys of putting one foot in front of the other. Slow down. Open your eyes to the wonders of the North American continent. Discover hidden strengths within yourself. And know at the end of the day that you have accomplished something special. There is nothing chic or trendy about the eternal verities out there under the sky. But that's why decades from now people will still treasure a weekend or a fortnight on the Sea-To-Sea Route.